Summary: Curiosity successfully drills into the clay unit. 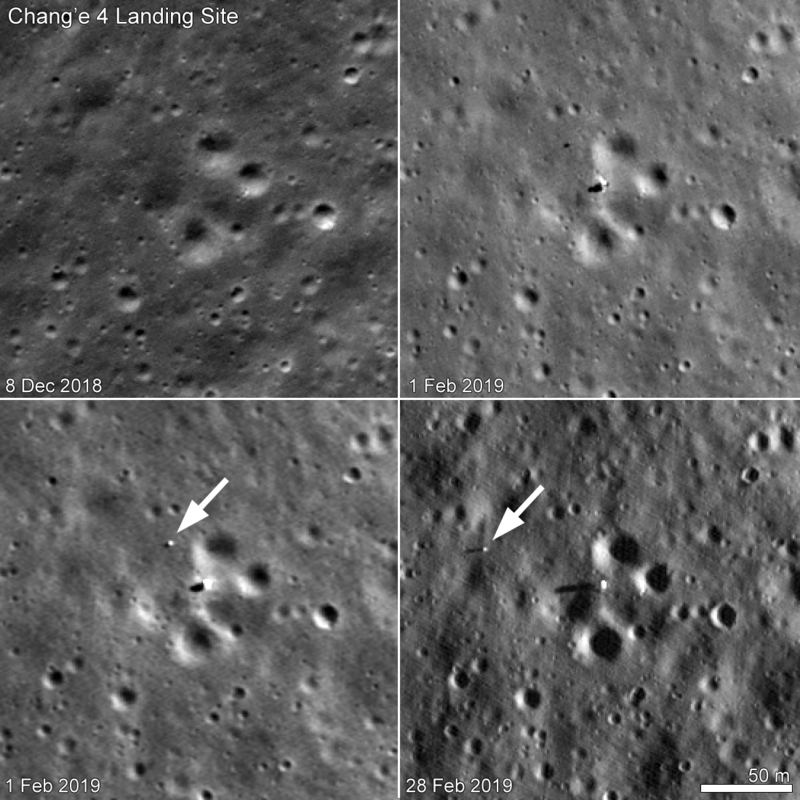 Yutu-2 continues its exploration on the far side of the Moon. 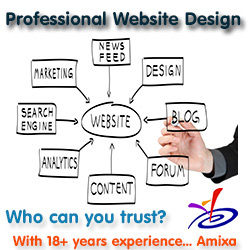 For the updates in 2018 go here. For a full list of updates before February 8, 2018, go here. For the overall context of Curiosity’s travels, see my March 2016 post, Pinpointing Curiosity’s location in Gale Crater. 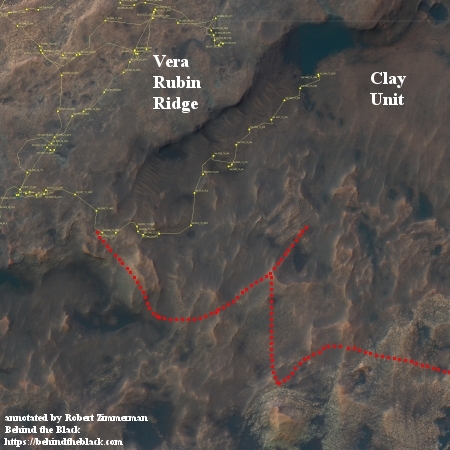 The news this week from Curiosity is that the rover has successfully drilled into the ground in the clay unit valley the rover is presently exploring betweent Vera Rubin Ridge and Mount Sharp’s higher slopes. The image to the right shows is a close-up of that drill hole. 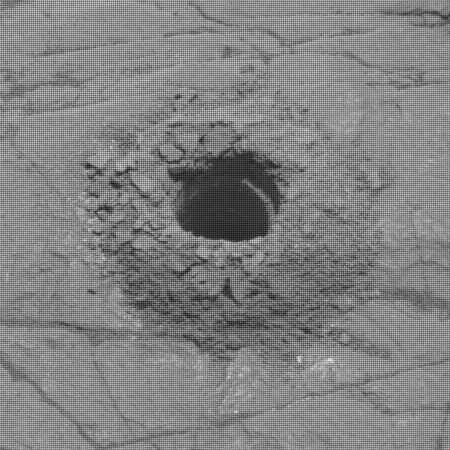 The rover’s drill chewed easily through the rock, unlike some of the tougher targets it faced nearby on Vera Rubin Ridge. It was so soft, in fact, that the drill didn’t need to use its percussive technique, which is helpful for snagging samples from harder rock. This was the mission’s first sample obtained using only rotation of the drill bit. Since my last rover update on February 20, 2019, they have been traveling for several weeks to get to a spot where they can do this drilling. The clay unit seems very soft, and almost mudlike, which made finding a good surface to drill somewhat challenging. Most of the terrain seemed too soft to drill into. It almost would be better to have a scoop, as the Viking landers had. Curiosity doesn’t really have this however. It needs to use its drill, which really is a more efficient way to get down deeper into the ground anyway. The map below shows their recent travels. The faint yellow line shows the rover’s actual travels. The dotted red line shows their original planned route. They have been traveling considerably farther north along the base of the slope up to Vera Rubin Ridge, heading to a point where that slope turns into a steeper cliff, which is where this drill point was located. This is a moment that the mission has been waiting for since Gale Crater was chosen as our landing site 8 (Earth) years ago! The clay bearing unit on the slopes of Mt. Sharp, which the rover is now parked on, is one of the primary reasons Gale Crater was selected over other competing landing sites and Curiosity’s suite of instruments is tailor made to investigate what materials comprise it. The drilling was a success. Next comes the analysis of the data. Don’t expect a report for several months, though I predict that they will announce that this geology proves that water once flowed on the surface here in Gale Crater! The clay beacon seen from space brought the rover here, but the region clearly has several other stories to tell. Now that Curiosity is searching this area, scientists can peer around as geological tourists, finding a landscape both ancient and new. There are several kinds of bedrock and sand, including active sand ripples that have shifted in the past year. Pebbles are scattered everywhere – are they eroding from the local bedrock? I expect once they have finished in this area they will head almost due south to return to their planned route. On March 30 the Chinese awakened both the Chang’e-4 lander and the rover Yutu-2 to begin their fourth day on the lunar surface. Since their nominal mission had been planned to last three lunar days, this awakening signals a big success for this mission. It really isn’t a surprise, but it is an accomplishment for the Chinese to be proud of, nonetheless. That lunar day is now ending, so I expect they are about to put both spacecraft back to sleep. We will have to wait for them to release data, as China does not run as open a program as the U.S. 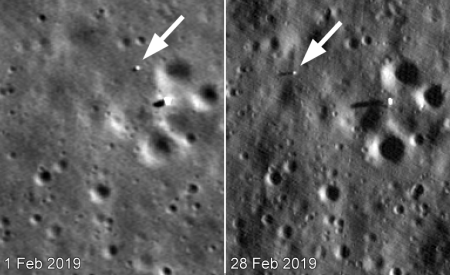 Right now we only know Yutu-2’s westward path because our Lunar Reconnaissance Orbiter (LRO) has been tracking it from orbit. That route however was for the rover’s third day on the Moon. We don’t yet have an LRO image showing its travels on the just ending fourth day. Though we no longer have Opportunity, the future for rovers on Mars is bright. In July 2020 two more rovers will be launched to Mars, Europe’s ExoMars Rosalind Franklin rover and NASA’s Mars 2020. When they arrive they will be added to these updates. The exploration of the solar system is definitely accelerating.